alaTest on kerännyt ja analysoinut 26 arvostelut lehdistä ja verkkosivustoilta. Keskimääräisesti, käyttäjät antavat tälle tuotteelle arvosanaksi 75/100. Lightsaber duels in augmented reality? Oh go on then. Lenovo Mirage: Jedi Challenges. A delicious augmented-reality setup that will delight Star Wars fans. Yes, there's a way to use a lightsaber and play Holochess at home. It just requires a phone and $200. The self-contained headset is wireless and generates some decent holographic effects. Will run on even some older iPhones and Android phones. A good handful of challenges and game modes. 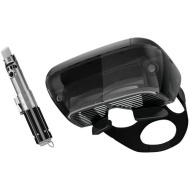 Comes with its own lightsaber hilt. Doesn't always track your movements or the lightsaber very well. Lightsaber sometimes drops up out of sync. Requires a phone. Inserting and setting up the phone isn't easy or quick. Who knows if this will ever run other games? Lenovo's AR helmet for phones feels like a clever mini-HoloLens for Star Wars fans, but as a standalone headset with no other software, it's a tough sell. "This is epic!" So said my son when I strapped the mirrored headset to his face and stood off to the side as he swung a lightsaber in the air. He was fighting battle droids. I was making sure he didn't break anything. Forget Microsoft's 'mixed reality', being a Jedi in AR is way more fun. We got hands-on with the Lenovo Star Wars Jedi Challenges inside the Mirage headset.